Checking back in the archives, I just noticed something fun. As of last week, the Black Pot is one year old! As I mentioned when I first created this blog, it all got started when my dear wife bought me a Lodge 12" regular dutch oven for Father's Day. I've been cooking in it ever since. I've also added five more to my collection since then. I'm kinda curious, folks, where you're from. In the year I've been doing this, I've gotten some good contact from folks that read here, but I'm curious where everyone is reading. Post a comment and just check in and say what city or state or region you live in. Yesterday, thanks to Ranes Carter, the Storm Mountain IDOS chapter head, I got to participate in the Spring Convention of the International Dutch Oven Society (IDOS). Held at the Utah Davis County Fairgrounds, there were three buildings in use. One held classes, one had vendor booths, and the third one had cooks. There were two parts for the cooks, one was called “A Taste of Dutch” which is where I got to be, and another was for a Youth Cookoff. I’ve not had many opportunities to cook for the public. This really was only my second time. 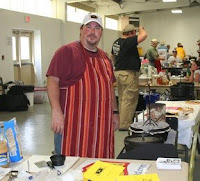 The first was last year’s Eagle Mountain Pony Express Days cookoff. This wasn’t a cookoff (at lest not where I was) so we weren’t competing, it wasn’t a Dutch Oven Gathering (called a DOG by those that do them), it was really more of a demo, but on a bigger scale, with lots of cooks and booths. When I arrived, I really had no idea what to expect. Fortunately, I was sharing a booth with Ranes, who was the organizer of the TOD part of the event. So, he knew what was going on. I was scheduled to cook a breakfast dish and a lunch dish, so I got there pretty early, and got set up and cooking right away. Pretty soon, someone came by and let me know that in order to comply with health codes, I needed to wear either a hat or a hair net. I had seen some hats for sale at the IDOS main booth, so I jumped and ran over there. I’ve been intending to join IDOS for a long time, but their website doesn’t take credit cards or paypal, and I never had the cash in hand at any of the moments that I had the opportunity to sign up. So, I signed up and bought a hat. I also got this years membership pin, which I proudly displayed on the hat. It wasn’t until I got home that I realized that in my hurry to pin it on and get back to cooking, I had pinned it in upside down. Oh well. The doors opened to the public at about 9:00 am, and people started coming through. I had been cooking my dutch oven biscuits and gravy, and just about the time that real visitor traffic hit, at about 9:30 or so, it was all ready. The biscuits didn’t turn out as well as last week’s. I’d pulled a different recipe, and it just didn’t turn out as well. I could tell it wasn’t going to be the same, because the dough was heavier to begin with. But the gravy turned out great. I chopped the biscuits into sixths and put them into little tiny sample cups and poured some gravy on each one. A lot of people liked them. I hope so, because I never got to taste it! All of a sudden I realized that it was all gone! I did hear lots of compliments, so that was a good sign. The folks at Rhodes Bread were part sponsors of the event, and in addition to doing a class over in the lesson/demo building, they also donated a ton of cinnamon rolls and other doughs for us to cook up and serve. So, since that was a part of the booth where Ranes and I were, I chipped in on that, especially after the biscuits and gravy were done. Now, I’m a “make it from scratch” kinda guy, generally speaking. Last Halloween, for example, I decided I was going to make pumpkin pie, so I made it from pumpkins. Still, I gotta say, these frozen rolls turned out really nice. They take a while to thaw, and then to rise, but they cook up well. In this setting, especially, where you gotta make a lot for the people coming through, it worked out great. Once we’d started cooking, one of the vendors came over and asked us to demonstrate his product. It’s an aluminum foil dutch oven liner. It looks basically like those disposable roasting pans that you can get in your grocery, but it’s shaped to fit into a standard 12” dutch oven. At first I was skeptical. And, in some ways, still am. But Ranes and I agreed to help him out. So, we started cooking in them. In some ways, they were very convenient. The biggest benefit I noticed came the next time some of the Rhodes Rolls were done. Normally, when you’re done cooking bread, you have to grab a couple of gloves or hot pads, heft up this huge, heavy, and hot dutch oven, and flip it over onto a table to shake out the rolls. With the liner, you just lift it up, and turn it over. It was much easier. Cleanup, of course, is much easier. I don’t have much problem with that, though. My ovens have a pretty good patina on them, so I really don’t have a tough time cleaning them up. A few scrapes, a few rinses, coat them again, and I’m good to go. When you’re doing breads, and you’re basically heating the air around the bread, the liners work really well. In the afternoon, I did Masaman Curry, and I tried the liner for that as well. It took a little longer to sautee the onions, and to heat up the curry pasted to activate the flavors. I think that’s because there was no direct contact between the pot and the food, but there was a layer of air and another layer of aluminum. Also, I’d gotten an email a couple of weeks ago from a company making bacon flavored salts, and they offered to send me some if I’d review them here in the Black Pot. They arrived the night before, so I took them with. I can’t say that I gave them a fair trial, though, because I only used them in the Biscuits and Gravy for the morning. The gravy had lots of sausage in it, so that would have affected the flavor, too. Plus, like I said, I never got to try anything I cooked, so I couldn’t tell you how it tasted! But I will try them in something I cook up and let you know. I did use it when I made some eggs for dinner at home, but that wasn’t in a dutch oven. Still, it tasted good! So, for lunch, I did the Dutch Oven Masaman Curry. That had a lot of people wondering. Many who walked by had never heard of it, nor had ever tried anything like it. Still, they seemed intrigued and said they’d stop by again when it was ready. Well, when the time came, and I was ready to declare it done, I looked up and saw a line of visitors waiting for their sample. I swear the line was three booths long. I was floored! And the other booths at the time were in between dishes, and all the people in the line were looking ahead at me. Wow! I suddenly panicked! I started filling up the little cups as fast as I could. First the rice, then the curry. First the rice, then the curry… Finally, just about the time that the crowd started to fizzle, it was all gone. I mean gone. A completely full 12” shallow dutch oven was empty. At that point, I was exhausted. I started cleaning up my station, because I knew that Ranes had promised that space to someone who was going to come in and cook an afternoon dish. I did help Ranes with a couple more batches of Rhodes breads, and helped him serve the line waiting for his Jambalaya (which was REALLY good). Then I came home and crashed and burned. I know this post is a long way to scroll down, but thanks for following! 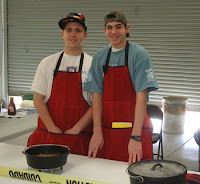 I didn't get the names of these two guys, but they were participating in the youth cookoff. Initially, Brendon was going to attend with me, and maybe even participate, but then we found out that you have to be at least 12 to do the cookoff. And then, he wanted to go to a friend's house for a sleepover the night before. Anyway, I think these guys did a barbecue sparerib dish in their dutch ovens. It looked really good, but I don't know how the judging turned out. If anyone that went to the event visits the Black Pot here, and knows who won, please post a comment! There were probably about 15 or more cooks in the taste of dutch. It was a lot of fun gathering and seeing people that I've met at other meetings and events. This lady was serving up some barbecue sausages, and her friend had made stuffed mushrooms. I've been thinking about doing that as the appetizer for my mother's day dinner, so I watch her with interest. This picture also gives a bit of an idea of the crowds that were attending. There aren't too many pictures of me here at the Black Pot. There's a couple of reasons for that. One, as a dumpy 45 year old who's losing his hair and his mind, I don't really consider my dashing good looks as a major selling point for the blog, here. On a more practical level, since I'm the one with the camera, and I'm the one cooking, it's not always easy to get a picture of the chef. The guy in black, behind me, by the way, is Ranes. A really nice guy, even if he is stressed! Finally, this guy's shirt caught my eye! You can't really see it unless you click to enlarge the picture. Still, that image summed up my Dutch Oven experience! Some days, it feels like life, the cosmos, and karma are all three conspiring against you. The coals won’t stay lit, the storms rage, the winds rush, and it’s just plain tough to cook your food. Then the recipe bombs and you end up with something that is almost, but not quite, totally unlike what you had thought you were cooking. Sometimes, it’s still edible. Other times, it’s not. Well, today was definitely NOT one of those days. It was truly the first day of spring. I know the calendar says that a couple of weeks ago was the first day of spring, but this weekend was truly the first spring-like weather we’ve had for more than five or ten minutes. Beautiful temperatures, sunny skies, light breezes… It was a perfect day to dutch oven. Frankly, it was a perfect day to do just about anything outdoors. For several weeks, now, I’ve been planning this tomato soup. I’d read what looked like a really good recipe, and I’d thought of some things that, in my mind’s tastes, would really enhance it. It was to be made from scratch, as I tend to like doing. And by “scratch”, I mean “from tomatoes, not from a can". I’ve been excited to try it. In fact, I’d pretty much decided that if I could pull it off, I would make it one of the first courses of my big Mother’s Day dinner, to come in a few weeks. I’d also thought I’d do a sourdough bread to go with it, but my start didn’t have enough germs in it, I guess, so it never really rose much. I had to throw it away. I still wanted to do a bread, though, so I thought that I’d try some biscuits again. I’ve never really had much success with biscuits (or any baking powder/soda based leavened bread). I really needed to master it. Well, it all came together. A beautiful day, some magnificent biscuits, and possibly the best soup I’ve ever tasted. And, I decided that since it ended up being so incredibly different from the original recipe, I’d claim it as my own! 12” Dutch Oven, with lots of coals underneath to keep the soup boiling, then simmering. Somewhere around 20+. I started out by firing up a whole bunch of coals. Lots of them. I put the 12” over some 18-20 coals, and put in the first set of ingredients. I just let the onions and garlic cook to transparency. Then, once they were getting done, I added all the second set of ingredients. I seasoned it at that point, and then again later on. It took quite a while for it to start boiling. I had to keep the lid on, although I didn’t actually put any coals on the lid. I just kept it cooking and simmering while I made the biscuits. After that, I let it simmer a while with the lid off. I had thought to cook it down, some, but it’s not easy to get enough coals under it to keep it boiling much without the lid on. With about a half hour to go or so, I added the flour. I actually added it with a fork, so I could just tap it and sprinkle it into the soup. Then I’d grab the whisk and blend it in. That just thickened it up a bit. Not too much. I started by just combining all of the dry ingredients, then added the shortening into that. With a pastry cutter, I mixed it all up, then added the milk. When that was a nice, hefty dough, I pulled it out of the bowl and onto my floured countertop. I rolled it out, the folded it over. I kept doing that five or six times. Roll it out, fold it over. Sometimes I would flour in between folds. While I was doing all that, I’d put on some more coals. A lot of them, in fact. I was shooting for 400 degrees. Once the coal were white, I put the number shown above and below, with some more shortening in the oven. I checked to see when it would finally melt and coat the bottom of the oven. With the biscuits rolled out, I cut them into circles with a small drinking cup, and then folded up and re-rolled the dough. Finally, I had cut all I could out of the dough, and I carried the dough rounds out to the dutch ovens. The biscuit oven was now pre-heated. I had decided to try a trick I’d read about. I set one of the biscuit dough rounds into the dutch oven, into the melted shortening. Then, I turned it over and set it in place. That coated what was now the top of the biscuit, and supposedly that would make for better browning. I did the same with all the dough discs, and then I set the dutch oven lid with the coals back on the biscuits. I cooked the biscuits for about a half hour, turning every five to ten minutes. That pre-heating the oven thing was just the trick. The biscuits were light, fluffy and raised up. That’s the first time I’ve done biscuits that worked that well. And, as I was cooking it, I realized that with only a couple of ingredient changes, it could have been a completely vegetarian meal. If I’d used veggie stock instead of chicken stock, or even just water, and if I’d used something besides milk in the biscuits.